While plenty of franchises go big with advertising at New York Comic Con, Marvel’s Daredevil decided to get adorably low-key with its viral marketing campaign. According to Collider, the show didn’t play up its impressive stunts, gritty visuals, or compelling villain. Instead it hung up cheapo ads for Nelson & Murdock Attorneys At Law. The ads direct people to a one-page website where they can download a watercolor drawing of Daredevil. Admittedly, that seems like a rather odd thing for Matt Murdock and Foggy Nelson to be posting online, given that they want to keep Matt’s Daredevil identity a secret. But maybe they’re just trying to capitalize on the popularity of a Hell’s Kitchen hero to advertise their own courtroom heroics. 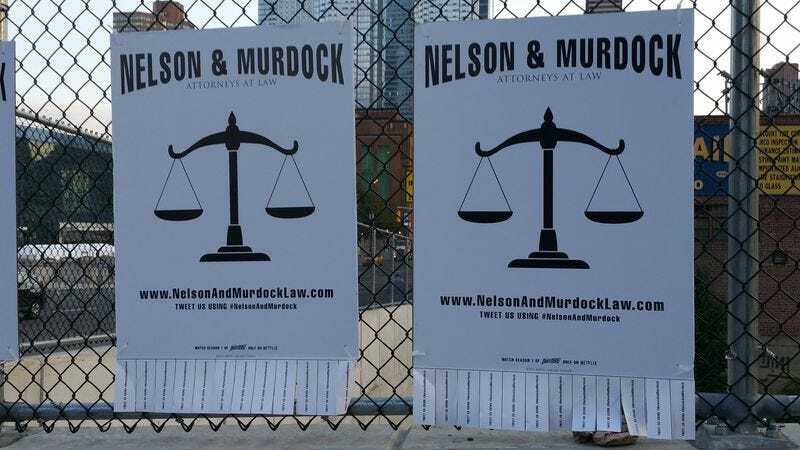 A quick search of the hashtag #NelsonandMurdock also reveals another ad on a bench, as well as business cards that are being handed out. Collider also thinks someone might be walking around in a Nelson & Murdock sandwich board. It’s clearly meant to replicate the kind of cheap advertising broke lawyers like Nelson and Murdock could actually afford. It also, however, makes it seem like Marvel has gotten a little stingy with its marketing budget lately.